Here is an interesting little article I found wandering about the net. Please note ALL the text below is reposted from Darrien Naish — and not original. My “Block Quotes” still are not working so it is hard to distinguish off-site material from my own. 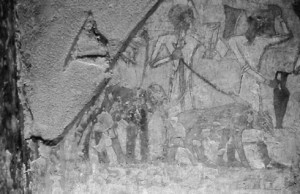 Did the ancient Egyptians know of pygmy mammoths? Well, there is that tomb painting. 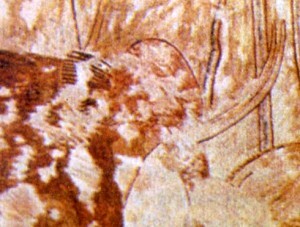 In 1994, Baruch Rosen published a brief article in Nature in which he drew attention to the small, tusked, hairy elephant in the painting, shown as being waist-high to the accompanying people. The people next to the elephant seem to be Syrian traders, carrying objects that include tusks (note that a small bear is shown in the painting as well: that’s very interesting but I don’t have time to discuss it here). African elephants Loxodonta and the now extinct Middle Eastern population of the Asian elephant Elephas maximus were both known to the ancient Egyptians, but Rekhmire’s elephant doesn’t seem to be either. Its apparent hairiness, convex back and domed head make it look like a juvenile Asian elephant, but then why it is shown with huge tusks? It seems to have a fairly large ear [the best close-up I could get is shown below], though whether this ear is shaped more like that of Loxodonta or Elephas is difficult to say. Inspired by the then-new discovery that a dwarfed population* of Woolly mammoths Mammuthus primigenius were still living as recently as 3700 years ago (albeit on Wrangel Island in the Siberian Arctic: Vartanyan et al. (1993), Guthrie (2004)), Rosen (1994) made the tentative suggestion that the elephant shown in Rekhmire’s tomb might actually be a dwarf Woolly mammoth. If true, this would have radical implications. It would mean that the ancient Egyptians had a trading link of sorts with far eastern Siberia, and also that mammoths were captured and then transported alive to Africa! * Richard Stone’s 2002 book Mammoth: the Resurrection of an Ice Age Giant includes the claim that Dirk Jan Mol was able to discredit the idea that the Wrangel mammoths were dwarfs (or dwarves. Whatever). Apparently, the ‘dwarf’ ones were just small, old females. I haven’t read this anywhere else – does anyone know if this is correct, and was it ever published anywhere in the technical literature? However, Rosen (1994) also made the suggestion that the elephant in the painting might be a symbolic representation of an elephant rather than a ‘real-life’ depiction of one. The idea here is that, since the accompanying person is shown carrying tusks, the artist added a miniature elephant to signify the known origin of these tusks. The suggestion has also been made that Egyptian artists sometimes showed non-human animals as smaller than actual size in order that the animals didn’t take up too much space in the illustrated procession (Davies N. de Garis, cited in Masseti 2001). 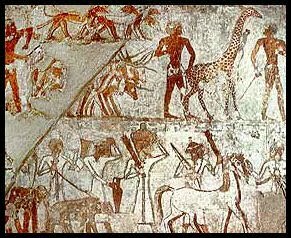 But then some people say that Egyptian artists just didn’t do things this way and, in any case, the elephant in the painting doesn’t look stylized – it’s depicted as a real, life-sized animal. 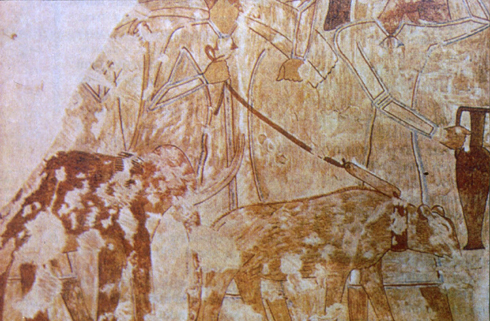 Counting against the idea of the hairy dwarf elephant being a stylized miniature is the fact that a giraffe also featuring in Rekhmire’s tomb was shown as tall as possible [the image of the tomb painting shown here is borrowed from this article on Rock Art Blog]. Doubtless some of you know much more about the habits of Egyptian artists than I do, so please tell us if any of this is or is not reasonable. A late-surviving dwarf Mediterranean elephant? As you may already have guessed, there is then a third possibility: this being that Rekhmire’s elephant is neither a Siberian mammoth nor a wrongly-scaled ‘symbolic’ elephant, but perhaps a depiction of one of the pygmy Mediterranean island-dwelling species. 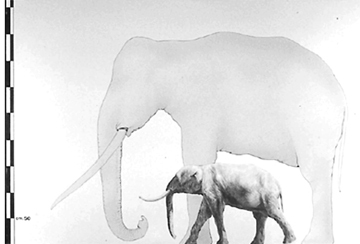 Most of the dwarf Mediterranean elephants were Pleistocene animals that were long gone by the time of the Pharoahs, but Masseti (2001) noted that a population of dwarfed elephants seem to have lingered on in isolation on the Greek island of Tilos (located between Rhodes and Kos). The Tilos elephants apparently remain unnamed [UPDATE: not true, they are Elephas tiliensis Theodorou et al., 2007] but have often been compared to E. falconeri of Malta and Sicily. Incidentally, these Mediterranean dwarf elephants are still very frequently said to belong to Elephas, but is this right? Aren’t they most likely part of Palaeoloxodon? The latter is frequently stated without ambiguity (e.g., Caloi & Palombo 2000), yet still we’re stuck with an archaic taxonomy. Hopefully this will get sorted out eventually [adjacent illustration, showing a Tilos palaeoloxodontine to scale with the probable ancestor Palaeoloxodon antiquus, is by A. Mangione and borrowed from Masseti (2001). And Burian’s classic painting of a Mediterranean pygmy elephant is shown below]. Anyway, radiocarbon dating of the Tilos dwarf elephants apparently puts some of them as recent as about 4300 years old (+/- 600 years), meaning that they overlapped with the presence of Bronze Age people on the island (Masseti 2001). The remote possibility exists, therefore, that Tilos elephants were captured by ancient Aegeans and then traded between Aegeans, Near Eastern people, and Egyptians – in fact, known trade did occur between these regions during the late Bronze Age at least. There are a few other possibilities that could explain the look of the Rekhmire tomb elephant though. I said earlier that its large tusks demonstrate adult status, and hence show that it can’t be a juvenile Asian elephant. 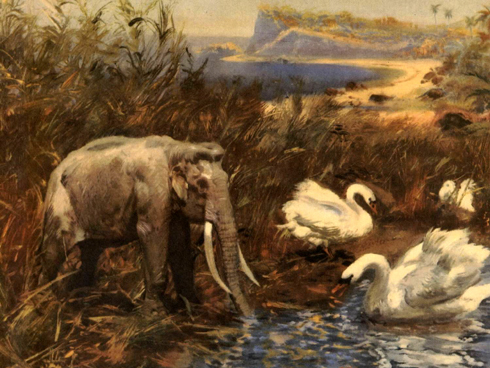 But maybe, just maybe, the painting could depict a freak juvenile Elephas that precociously developed large tusks. We know that African forest elephants L. cyclotis can be precocious in terms of tusk growth (this may partly explain sightings of alleged Pygmy elephants)*. Any such individual would perhaps be regarded as an unusual thing of interest and value. And there’s also the possibility that the animal depicts an individual from another late-surviving dwarf population that we don’t know about. Some of the extinct Mediterranean dwarf elephants are now suspected of being dwarf mammoths (as in, members of Mammuthus) rather than species of Elephas/Palaeoloxodon and, in life, these animals might indeed have looked more like the hairy, dome-skulled animal in Rekhmire’s tomb [the photo of the section of the painting below is by N. Douek Galante, from Masseti (2001)]. * Indeed White (1994) suggested that the Rekhmire tomb elephant could depict a miniature African elephant. At first site this looks unlikely to be right in view of the Rekhmire elephant’s hairiness, highly convex back and domed head. But you could play devil’s advocate: maybe the artist screwed up (after all, none of the features are as clear as we might like), and is the animal really shown as being hairy? Maybe those lines are meant to be wrinkles. And African elephants can be very brown-skinned. As is so often the case with pieces of evidence like this, it’s likely that we may never know the truth of the matter. But not only is it fun to speculate, our speculations can mean that we gradually winnow away the possibilities and perhaps get closer to the truth. The notion that ancient Egyptians could have gotten hold of dwarf Mediterranean elephants, for example, is more likely than the more incredible suggestion that they somehow had access to those from a Siberian island. One more thing to note: at the time of writing I haven’t seen Alexandra van der Geer et al.’s 2010 book Evolution of Island Mammals: Adaptation and Extinction of Placental Mammals on Islands. It may well contain some very relevant and interesting material on dwarf, island-endemic Mediterranean elephants that I should be noting and citing. Hey, if I had the book here, that’s exactly what I would be doing. But I don’t. Caloi, L. &. & Palombo, M. R. 2000. Dwarf elephants of the past. In Shoshani, J. (ed) Elephants. Checkmark Books (New York), pp. 60-63. Guthrie, R. D. 2004. Radiocarbon evidence of mid-Holocene mammoths stranded on an Alaskan Bering Sea island. Nature 429, 746-749. Masseti, M. 2001. Did endemic dwarf elephants survive on Mediterranean islands up to protohistorical times? In The World of Elephants – International Congress, Rome 2001, pp. 402-406. Vartanyan, S. L., Garutt, V. E. & Sher, A. V. 1993. Holocene dwarf mammoths from Wrangel Island in the Siberian Arctic. Nature 362, 337-340. White, W. 1994. Painted out. Nature 370, 604.